Summer is almost over. What?!?! I got out in mid May and go back next Thursday, so I know for some of you summer is very much still happening, but for me it is coming to an end! I'm starting to think about how the first week of 5th grade is going to look in my class. The kids come back on a Wednesday, so I'll only have 3 days to plan out. The next week we start our first novel and regular week. Like I've said before, I use my planner from April to roughly map out the school year. Anytime the kids aren't going to be there, I highlight in green. This way I can see exactly how much time I have to teach things before we assess them. I also use this planner to roughly plan out what is being taught on what days. This is NOT my lesson planner. I use another planner for that. I also write in major testing windows like the STAR test. So, what does those first three days look like? My biggest tip (and I'm by no means perfect at this!) is to not over plan! I have a few back up activities that are good for pulling out if needed, but I try not to plan too many must do activities because the schedule is always changing those first few days (or at least this has been my experience the past two years). This is really different from when I taught first grade. I remember the first few days of school in 1st... I was always running out of things for the kids to do while we were doing sight word testing and other benchmark assessments. Having the kids for only a certain amount of time means you can get off track quickly! I'm going to try really hard this time to keep all of my classes on the same page for the first week. That's easier when our actual routine begins, but the first week is difficult not to have some classes ahead or behind of the others. Let's talk each individual day! I LOVE starting back right in the middle of the week. If we start back on Monday, I feel like we have too much time to do beginning of the year activities, but not enough time to begin a full, regular weekly routine. What day of the week do you start back on? So the first day is busy, busy, busy! The very first thing we do is go over the class syllabus so the kids (and parents!) know what is expected of them. I have the kids take this home and get their parents to sign it. The kids keep it in their binder for the entire year. If you want to see my syllabus, let me know! The first 'activity' we do is my Faces of Fifth self portrait activity. 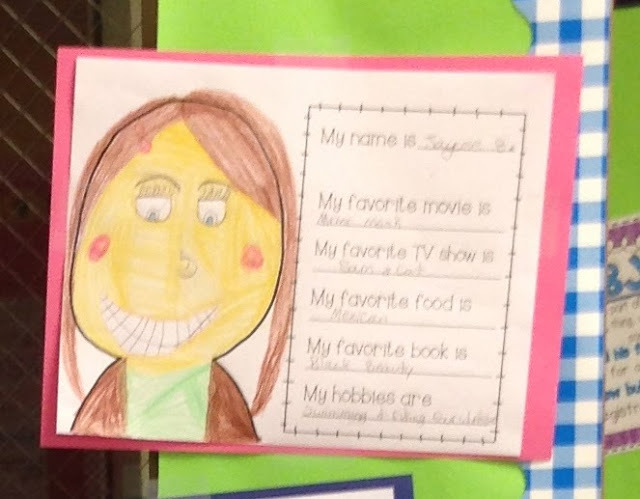 I remember worrying about if this was too young for fifth graders because I LOVED doing it with first graders. It's one of my favorite activities. And guess what? It's not!! Fifth graders are still kids too and they love to do fun things like this! You can grab a free copy of the template here. Next we begin our student interest survey. 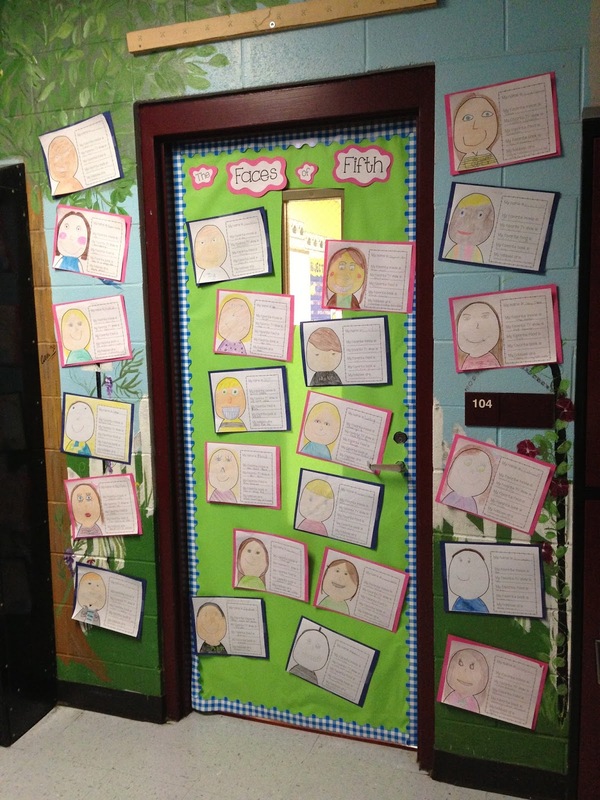 I love these because I get to see what kind of reader each kid is and more about their personality. It has questions like what kinds of books they like to read, their favorite hobby, tv shows, etc. I ask them to be completely honest and tell me if they don't like reading. I got this idea from the absolutely life changing book The Book Whisperer. You can grab a free copy of mine here. This is where I've made the mistake the past two years of planning too much. A few are done with the self portrait and interest survey on the first day, but the majority aren't. In the past, I've gone ahead and introduced a new activity when we weren't ready. This year, the plan is to finish any work from the previous day. Those who have finished will go ahead and visit our classroom library for the first time and pick out a book! Then, as others finish, they can choose their first book too. We have weekly library visits where the kids get two books, usually a picture book and a chapter book. I teach in the building that is the farthest away from the library (and everything! ), so having a good classroom library is a must! If I didn't, the kids would finish their book and not have anything else to read for the rest of the week. That just couldn't happen, so I focused the majority of my classroom money towards purchasing books for the library. I let students have a lot of say about the books I purchase. When I give out Scholastic book orders, I have the students create a wish list and then I find books that many students request and try and use bonus points to get those. On my end of the year reflection survey last year, one of my sweet girls wrote that our classroom library helped her discover that she loved reading. I'd call that money well spent! I'm *hoping* that Chromebooks will be up and running smoothly by day 3 and we can start practicing the basic such as emailing since that's how we start each day. You can read more about that here. Since hopefully everyone will have their independent reading book by day 3, we will start going over how to write their Status of the Class. *It will help get them in the habit on writing this after the tests. They can just go and grab their's from the shelf and get comfy and write! *It's more organized! They usually just cram their letter back in their binder when I hand it back. Now it will be in their 'book'. * They (and I! and their parents!) can see their writing improvement throughout the year. <------THE BEST PART!!! * Their own book makes it a little more "fun"
* They can reread past letters and reflect back on their thinking and their experience with that particular book. Let me know if you would like to see this in my TpT store! The binding machine is my new best friend! You can get yours here ! I love that this planner has this section for notes. I write what needs printing/copying here. The "color by PS" is my Color by Parts of Speech. That's an extra in case there's extra time that needs filling. Sorry the post ran a little long! I would like to see your syllabus and reading response letter book. I want to this syllabus too! Thank you! I am going to get those as well! You are helping me already! I am moving from K to 5th in August - oh my goodness, I am excited and scared! I am moving from 1st to 5th - I'm nervous and excited too! Good Luck! I would like a copy of your syllabus also. Hi! I love reading your blog and following your instagram. 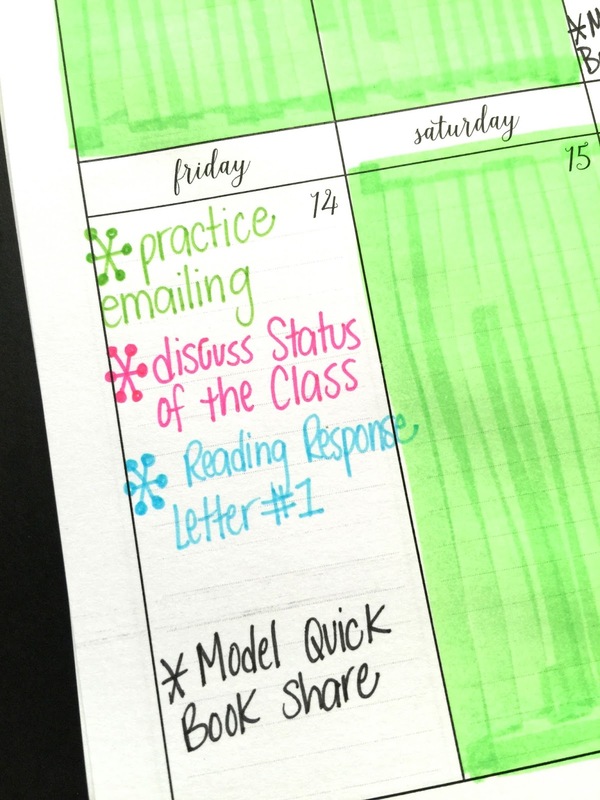 I do not have a blog but I would LOVE to see the reading response journal in your tpt store! I am moving from 2nd/3rd grade reading to 4th/5th grade reading next year and would love some more inspiration! I would also be interested in your syllabus. I would love to see your reading response letters in your TPT store! You have such good ideas! I would love to see your reading response letters in your TPT store. I would as well!! I will be teaching 3 ELA classes too! 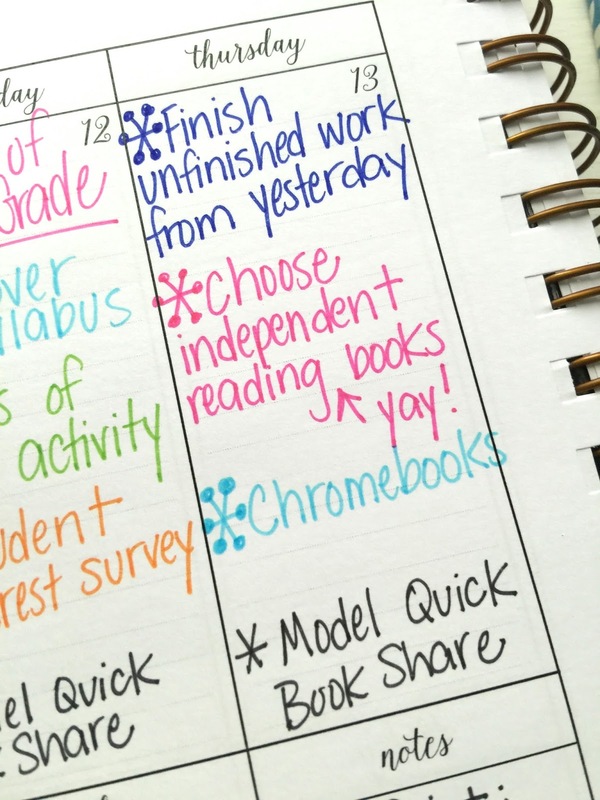 Thanks so much for sharing how you plan! I just needed to see how you use our planner for that! 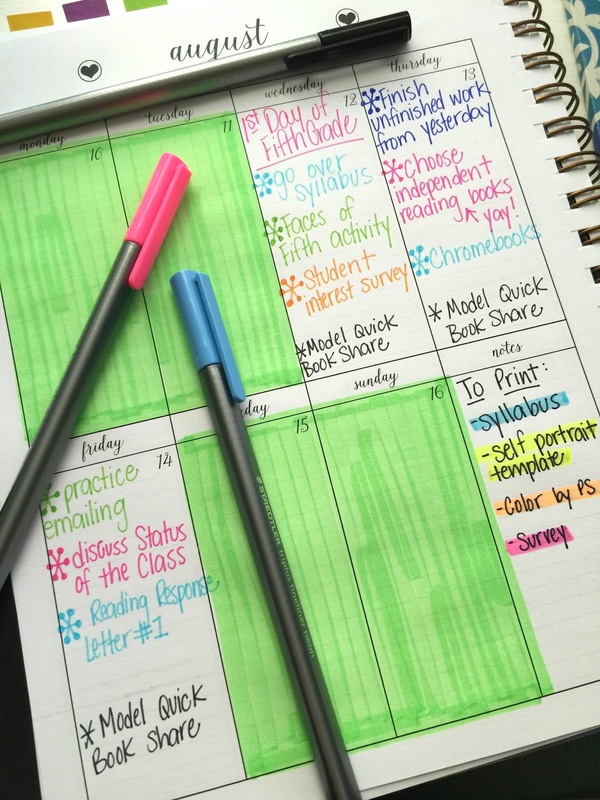 I have had my eye on a planner specifically for planning my days at school - switching from 5th Grade Literacy to the Intervention Specialist for Intermediate grades is really overwhelming me in terms of long range planning - back to Target (aka "The Hundred Dollar Store"...every time we go, it's at least a hundred dollars! :)) for more supplies! I would love to see your syllabus and reading response letters. I would love to see your reading response letters in your TPT store! I love this idea! I am starting this year with that same jump, from first to fifth and it is starting to feel a bit overwhelming. Love, that you are sharing your beginning week because I haven't had one yet ( I was a replacement teacher the second week of the year so I missed the intro days). I would like to see your syllabus! I would love to see your syllabus! This is my first year having my own class...5th grade reading! I was an EIP Reading teacher last year and have NO idea what I need to do as far as a syllabus goes! I would love to see the syllabus and reading response. I'm teaching 5th grade ELAR this year and I like your ideas. Along with everyone else, I would love to see your syllabus and reading response letters. I have been EC and switched mid year last year to fifth. This is my first time teaching fifth ELA so it is a bit overwhelming. Appreciate all your help and suggestions! I would love to see your syllabus! Also, I'd really like to see how you organize things in your classroom, such as how/where your kids turn in their work, how you keep track of missing work, how you organize centers and task cards (if you use them in your room). Thanks so much again, love your blog! 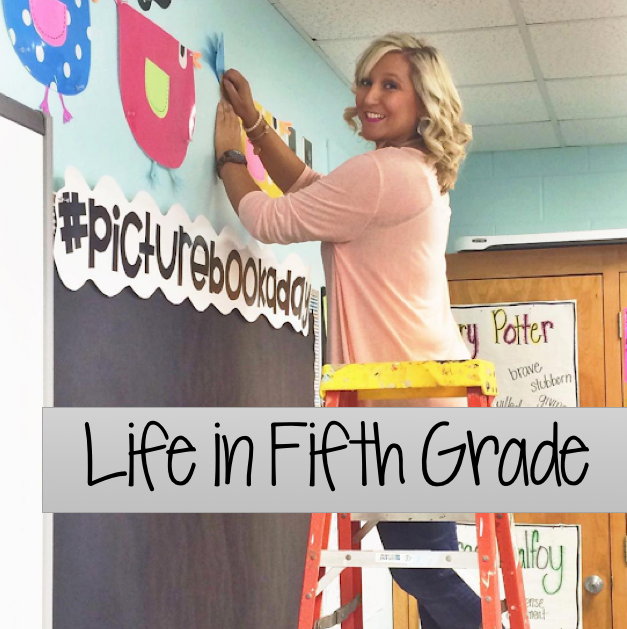 I'm hoping to share about that when I get my classroom finished! :) That's the plan, anyways! 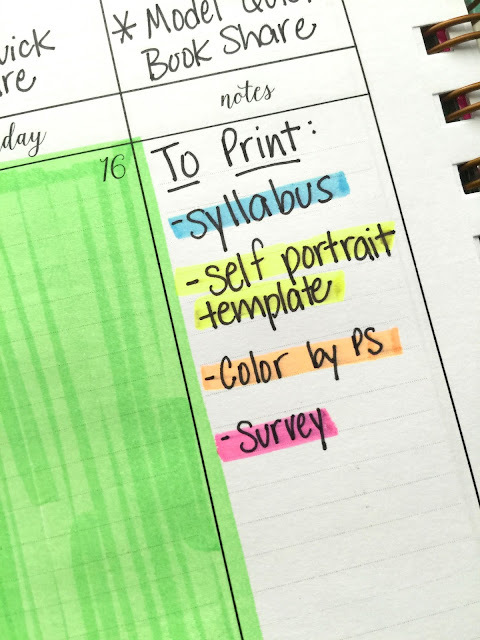 I'm currently working on a post about the syllabus! Hi, thanks for sharing your ideas for the first week. You have on there "model quick book share" I wanted to know what is your "criteria" for book shares? How do you guide them to share more than just "I liked it/I didn't like it/It was boring"? Thank you and good luck your first week! At first I just model what a basic book share looks like. I talk about that a little here. Would love to see your syllabus. So many great ideas in your post. Thanks for sharing!! I moved up from third to fifth ELA this year. 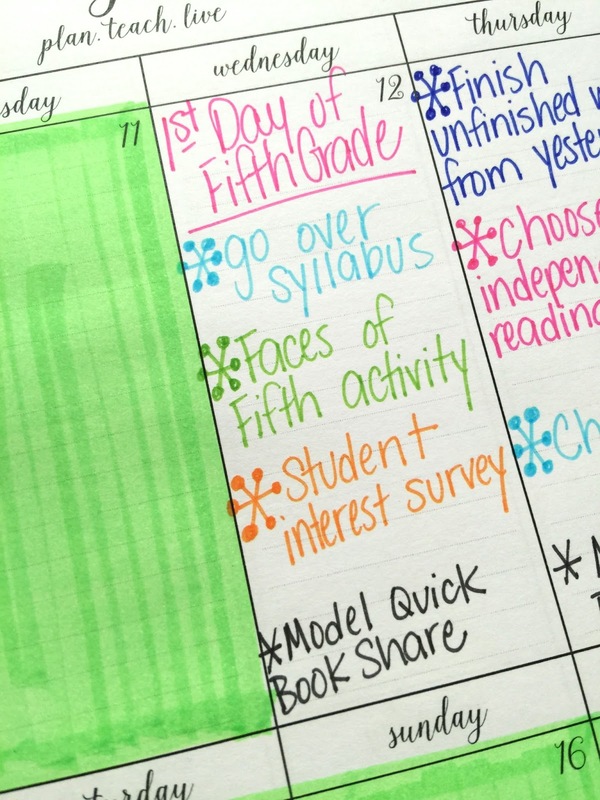 Have you ever tried interactive notebooks? I am giving those a try this year. I only have 50 minutes for each class-not much time to cover all that needs to be taught. How do you administer your spelling test, Chrome books? I'd love to see your syllabus and readers response! I'm starting in 5th this year and have been getting some great ideas from your blog and TPT store. Thanks!! Hi! I'd like to see your syllabus, please. Thanks! I'm in with the others. I'm curious about your syllabus and would love to see a copy as well as your reader response journals. I'll have my students using their Chromebooks to do their responses but I'd like to see your prompts. I don't use prompts...I just have them write about their book, so I'm not sure this would be helpful to you, but I've just uploaded the letters to my store. :) They might work!! Also would LOVE the reading response book in TpT - such a great idea and very organized, too! I absutely love this and would love to see your syllabus and reading response book too. Also, we are going 1:1 this year with chromebooks. Do you have any suggestions on teaching the students expectations and ideas for how to use it in reading/writing? I would love to hear your thoughts!! Thanks so much for sharing. I would love to see your reader response journals in your TPT store. Your blog has been so helpful to me this summer- I am moving from elementary to 6-8, and have been stressing over the change. Your blog has provided me with so much support. I am so over the moon about this post!! I looked for your reading response letters on TPT but didn't see them. I would love too!! Also, what does your syllabus include? Thank you!! I too would love to see your syllabus and reading response letters. I love this post. Very helpful and informative! I would LOVE to see what the inside of the Reading Response book looks like. I am incorporating a Reading Response notebook this year where my students will write to me once a week. Can't thank you enough for taking the time to share your passion for teaching! Your blog is a great "mentor" resource for all levels of teaching experience. I'm starting in a new district and I'm looking to modify my curriculum packet. I would love to see your syllabus... Sharing it would the students the first day is a great idea! Thanks for the interest survey. I'm interested in your reader's response sheets. I'd love to see your reading response letter booklet. I'm with all others love what I see and would love a preview of your syllabus. Your making me excited for the new year with all your organized ideas. I would like to see your Reading Response Letters! Do you grade your reading response letters? If so, what are some things you are looking for? Do you have some picture examples of student reading responses? Did you ever publish your syllabus?? Did you ever publish your syllabus? I am moving from 2nd to 5th and would love to see your syllabus. Hi! I was wondering what you do for "Status of the class"? Hi I was thinking about how do you buy all this stuff????? I will be moving from 2nd to 5th and would really appreciate seeing your syllabus that you give your students. I think that would help me get a little handle on the big jump. I would like to see your syllabus. Do you only teach language arts? ?